Things are starting to come together. For a few days I did have my doubts. I still have bins in the garage and family room but the other rooms are beginning to look a lot like Christmas! I had a blast with this antique dresser. 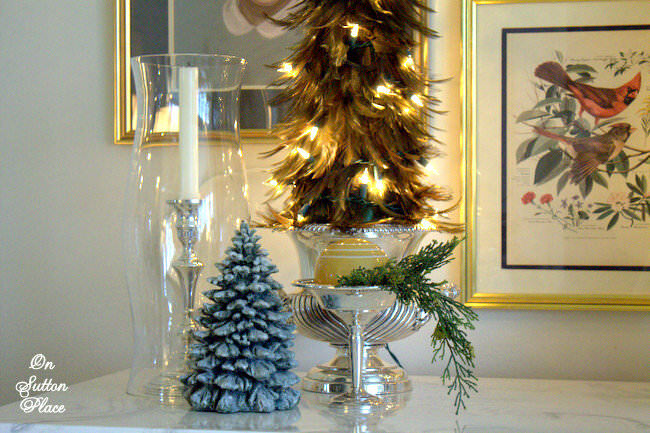 I put some feather trees in my silver urns, added lights and I had my starting point. Next came silver candlesticks, hurricanes and the rest just happened. This arrangement was put together with things I already had…very budget friendly. I didn’t buy one thing. I brought my pop of red in with grain sacks just laid over my slipper chairs, ticking pillows and candy canes. The sofa got some red pillows I used last year. They are inexpensive covers from IKEA but I love the color and they’re velvet. The coffee table is also a new look with old things. 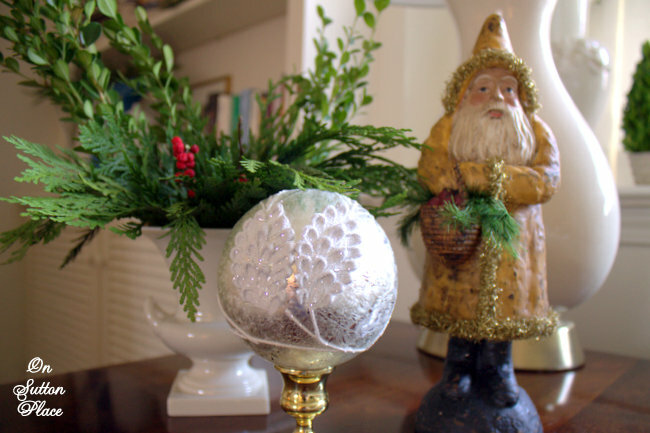 I took the gold balls from my tree…the santa and pine cone I’ve had for a while. I showed you my gigantic pine cones last year. Yep, they are making another appearance. Wait until you see what I’ve done with the others! This year my decorating is all about natural, neutral and trying to make use of things I already have. Breathing new life into old possessions is the best way to decorate with things you love. Move things around. Drag out that old silver and polish it up. Tie a ribbon on that pitcher you thought about giving to Goodwill. Group some old santas on a tray and add some fresh greens. It’s fun, it’s gratifying and it won’t break the bank. 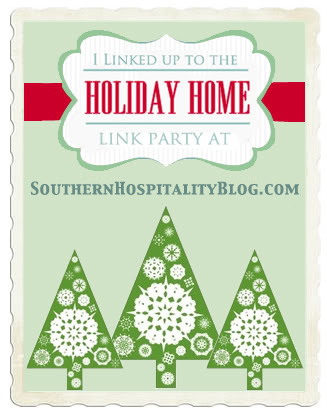 Our Homespun Christmas Link Party is finally starting tonight! The linky will go up at Savvy Southern Style around 8 p.m. 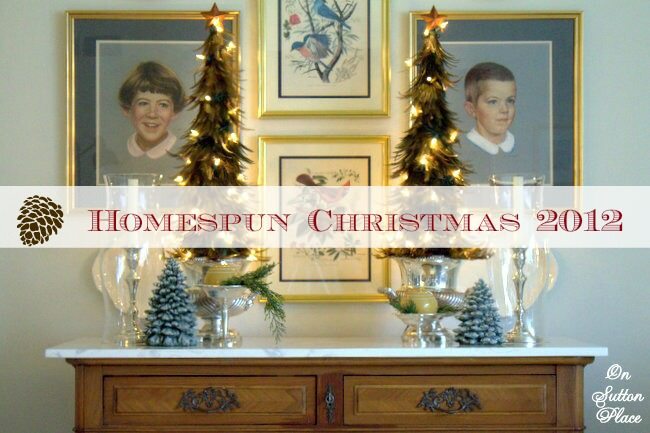 Please join us and share your Christmas mantels and vignettes. Kim, Anita, Yvonne and I hope to see you there! Ann, I was so excited to see you at the party this week, thank for linking up. 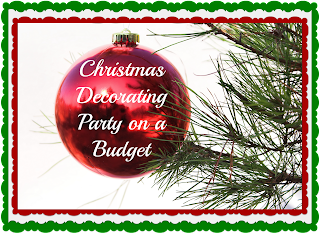 Isn’t it fun decorating will little to no money spent? The little touches of Christmas are so nice. I will be close to an Ikea this weekend and I will have to check out the pillows. That is a good way to add some more Christmas cheer! Everything is so pretty!! Love the large pinecone and your feather trees!! Simply gorgeous, Ann! 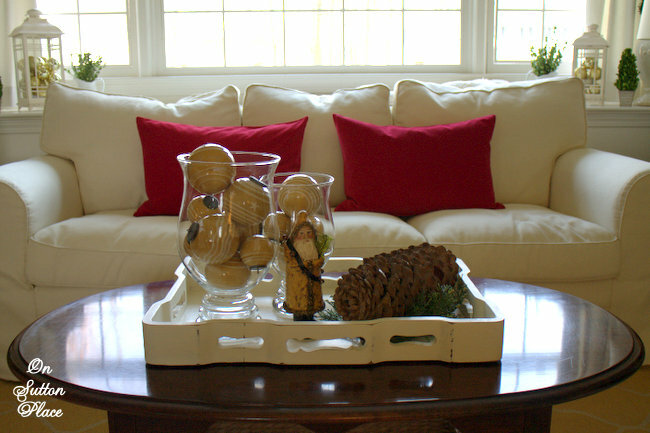 Love your feather trees … the oversized pinecone … and, how you added beautiful, seasonal pops of red. Happy Holidays! Those trees are so pretty, just beautiful Ann! Absolutely beautiful! 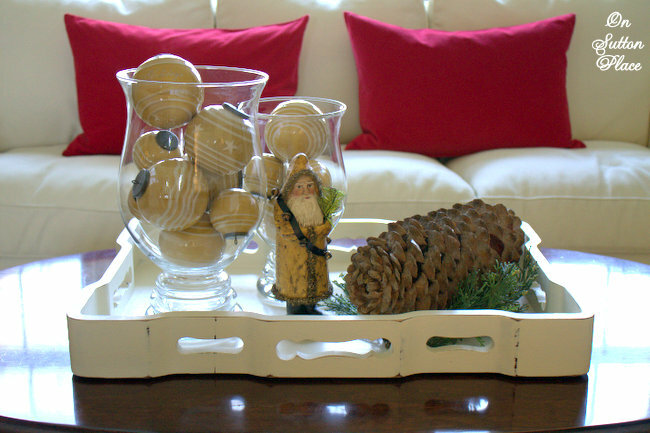 Love the tray vignette with the large pinecone, and the silver pieces! Your livingroom looks beautiful , Love those urns. It all looks so beautiful Ann. Elegant…. Everything is beautiful! I love that you used so much red with your yellow, it looks fabulous! The blue pitcher is lovely with it, too. The pillows are the perfect accents! Everything looks beautiful, I loe the urns and the little Christmas trees. 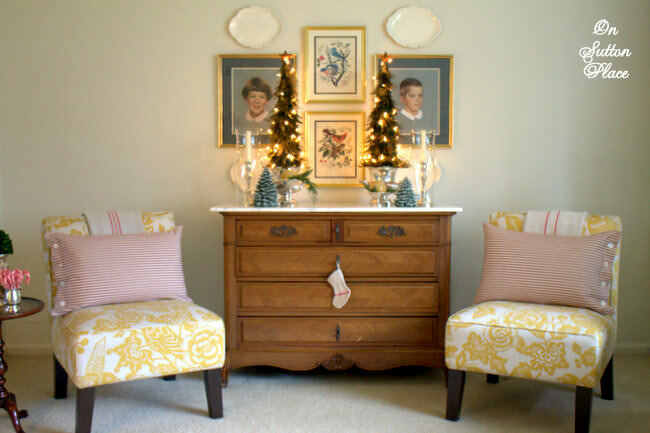 Your living room is so elegant, and I love your Christmas vignettes! 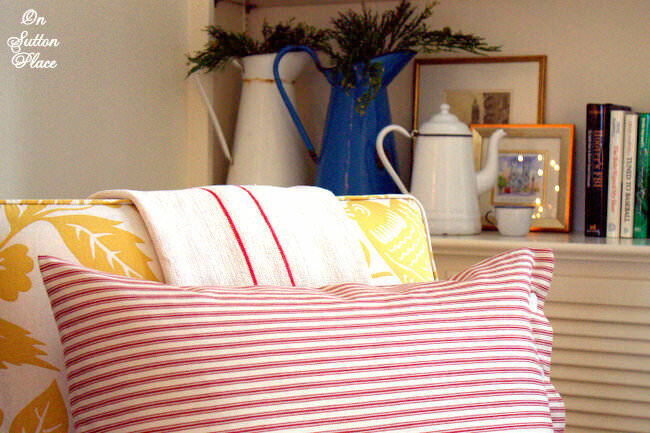 I like your red ticking pillows so much I just ordered one. 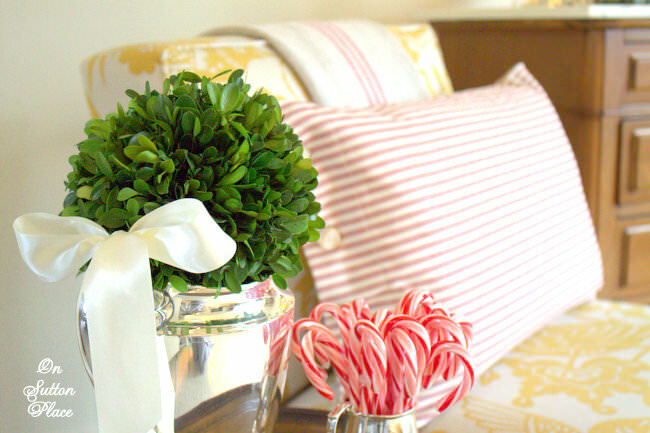 I have a red ticking candy cane pillow I’ve had for years, and I’ve been wanting a ticking pillow to go with it. Enjoy your Sunday! I’m *still* coughing, so I’m staying home from church. Very pretty, Ann! That little dresser has certainly made herself at home. : ) Your silver urns turns out to be a perfect pair to use for this vignette. I love how they look with the feather trees in them. Beautiful . Love feather trees. So pretty! I have yet to take my bins out of the attic…..perhaps next week! 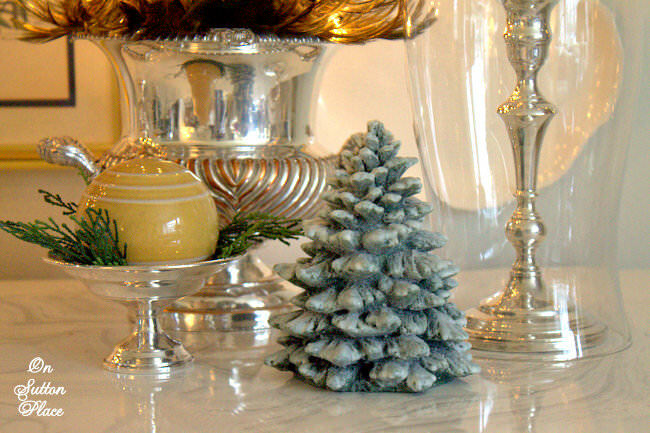 Your home looks lovely, elegant and VERY Christmasy! – Good job! You just never stop amazing me. Beautiful!!! Ann, it looks sew, sew, sew pretty! Sorry, I couldn’t help myself! I love how you put those feather trees in those urns! 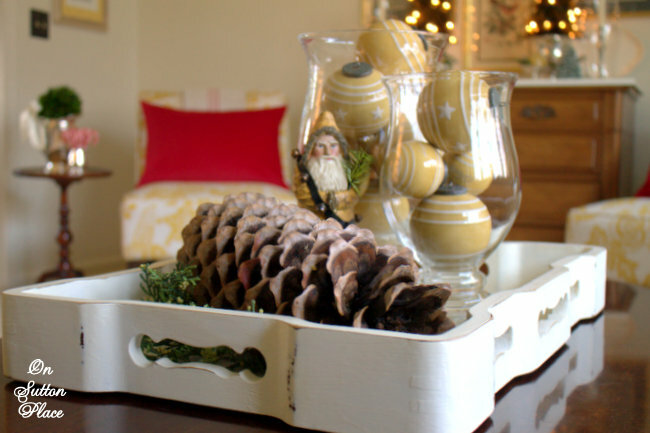 And your yellow ornaments looks so stunning in the tray along with that vintage looking Santa. It’s hard to believe that it’s already Dec. 1! Very pretty, Ann. I especially like the symmetrical buffet arrangement. Ann your living room looks FABULOUS!! I love the vignette on your antique dresser, so pretty! Wow, your living room is so pretty, love your grain sacks, Loving your trees, oh so pretty room! Silver urns and grain sack material…it doesn’t get any better! Beautiful ,you have a great eye. I too have tried neutrals and using what I already have and it looks sooo sad! I envy you. How beautiful, Ann! Your vignettes are gorgeous!! Beautifully done, Ann. The silver and greenery is so elegant. Ann, your home is look so lovely. Merry Christmas, friend. Your living room and vignettes are beautiful Ann. I love those red cushions on the sofa. They really pop! I’ll be joining in on the party later. This is such a pretty room, Ann! I love how it looks dressed up for Christmas! Very nice Ann! You did a great job with your decorations on the dressee! Love the pop of red on the sofa! Looks like you are really getting your Christmas on! Everything looks very pretty, elegant and festive, Ann! You have nice little touches everywhere without being overwhelming…I really like that! Beautiful, Ann. Your living room looks so pretty. I love seeing the sunny yellow and it looks fabulous with the pops of red. Ann, everything looks so fresh and pretty. 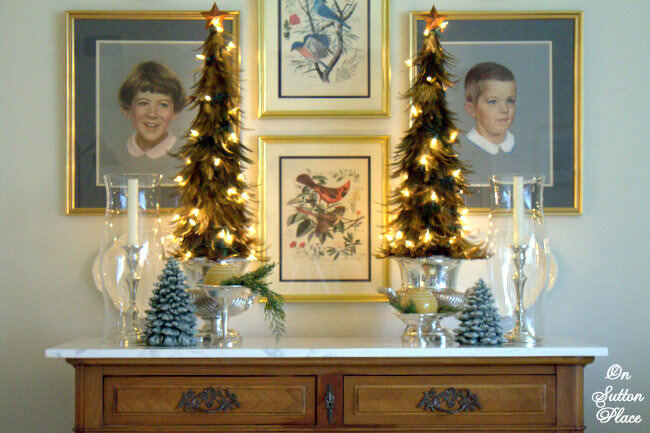 Your pops of yellow add a nice dose of sunshine to your Christmas decor. I spy one of your cute little grainsack stockings hanging on your chest too. I am planning on joining in the party tonight too. Really pretty Anne, I did the same thing, used what I had! Some were new this year because I bought them on sale after Christmas last year! Gorgeous! I love your holiday decor! I love shopping my own home for holiday vignettes too. Yours look great! I love the pillows on your chairs. I remember when you were thinking about painting that antique piece you brought in. I about had a stroke just thinking about it. So glad you didn’t. Your living room looks SO pretty, Ann. I really like how you’ve used silver in the mix. And I noticed your enamel pitchers lined up. Perfectly lovely! Love your vignettes, Ann. I am ready for tonight!